Spanish Briyani recipe by Danielle at PakiRecipes.com. A delicious and unique style of presenting rice with colorful veggies and chicken. After you have boiled your rice set it aside. Then fry onions lightly for 2 minutes quickly add diced tomatoes and cook again for 2 minutes then set aside. Next, Fry the chicken in tbs oil, after chicken is throughly cooked add to premade rice. Next, toss in the onions and tomatoes, then add the 7 packets of sazon stiring until rice turns orange /red while adding 2 additional teaspons of oil to moisten. Next add the chilli peppers and chopped cilantro. 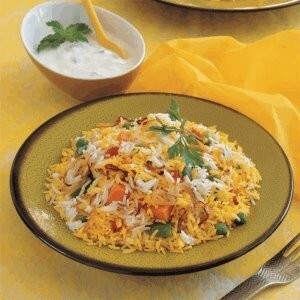 There you have a spanish style Briyani and my Homemade recipe. Enjoy!